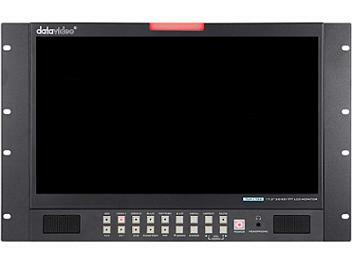 The Datavideo TLM-170GR monitor has an on-screen menu which allows control and set up of brightness, contrast, saturation, hue, sharpness, colour temperature and picture in picture. The menus can also be used to display onscreen overlays for frame marker, 4:3 marker, 16:9 Marker, Cinema Zone Marker, Center Point, embedded SDI Timecode and Monitor Title. The TLM-170GR Front Panel Buttons allow selection of source input as well as PIP, Aspect ratio, Blue only, Pattern (Colour Bars), Menu and audio controls. Input HD/SD sources via the rear panel SDI, HDMI, Component (Y, Pb, Pr), S-Video (Y/C) and Composite connections as well as monitoring RCA phono or embedded SDI / HDMI audio. Digital Audio Inputs : via SDI or HDMI inputs. Mono Audio Inputs : Single RCA phono socket for analogue inputs. Front Panel Buttons allow quick and easy selection of source input as well as PIP, Aspect Ratio, Blue only, Pattern (Colour Bars), Menu and audio controls.